Tuface’s decision to lead a protest to register the dissatisfaction of Nigerians with the performance of the incumbent administration and to reiterate the value of government’s responsibility to the people was his finest moment as a citizen and artiste. But it is also now, with his Jammeh-like volte-face, his worst moment. His transformation into a champion of democratic values and voice of the masses brought him added stardom and value. His retreat has turned him into a revolutionary manqué. He deserves our understanding and sympathy. When on 24th January Tuface (Innocent Dibia) announced that he was going to lead, under the umbrella of the Tuface Foundation, a mass protest against the economic policies of the Buhari government, he immediately attracted public interest. A multiple award-winning musician, a naturally talented stage performer and author of at least two evergreen songs: “My African Queen” and “If Love is a Crime”, TuBaba, as he is also known, sounded like he was moving from art to politics, and seemed ready to answer to the true calling of the artist as the conscience of the people. Artists and creative persons have always led protests and lent their voices to progressive causes. That much is the case in the United States at the moment, where artistes have raised their voices and joined protests to remind the “insurgent in the White House” that America is a land of freedom, democracy and justice and not bigotry and tyranny. Here at home, Fela, and his cousin, the Nobel Laureate Wole Soyinka, Chinua Achebe and others as well, have shown the power of creativity and stardom as a veritable vehicle for social change and justice. Artists and their art, and their movement from the stage, or the printed page, to the public arena of action have always saved humanity, by humanizing man. This has been the case from Sophocles, all through time and history to Olanrewaju Adepoju, Beyonce and Kanye West. But activism comes with a price. Tuface obviously didn’t bargain for that. He received enormous support. His announcement of the February 5, later February 6 protest energized the angry, frustrated Nigerian base, and drew our unrelenting “children of anger” back into an overdrive on social media. The international community also became interested, waiting to see the effect of a protest driven by star-power in Nigeria. It was coincidentally a season of protests across the world: in the Gambia, there had been protests against Yahya Jammeh with a positive outcome, in the US, the UK and elsewhere, Donald Trump’s travel ban on seven Muslim-majority countries and his misogyny led to protests on both counts, and in the case of the former, a Federal judge has given a ruling that has resulted in the suspension of the ban. In Cameroon, concerned citizens are protesting over discrimination against English-speaking Cameroonians. In Romania, a sea of protesting citizens has just had its way. There is all around the world, right now, a resurgence and affirmation of people power, be it Brexit or left-wing activism in Europe. Individuals and groups lead such moments in history- what makes them different is the fire in their bellies and their readiness to command the revolution, at great personal risk. It looked initially as if Tuface had that burning fire in his belly, but he couldn’t make that leap between self-preservation and the risks of rebellion. He had appeared on television. He spoke confidently about the need for real change in Nigeria. He encouraged Nigerians to come out en masse to support the movement. He even announced the color and dress code of the protest. His wife stood by him and she, too, talked about her husband’s convictions about national progress and good governance. Each time Tuface appeared in the media, during those five minutes in the sun, he looked bright and determined. But everything changed late Saturday evening. The recorded video of Tuface’s volte-face, announcing the cancellation of the Feb. 6 protest showed him looking dispirited, broken, ashen as if he had been shaken up and chastised. He looked unsettled with his scraggy, uncombed beard. It is not difficult to know when a man’s balls have been squeezed. Tuface actually deserves our sympathy. He must have gone through a lot of pressures that broke his spirit. His capitulation makes us appreciate even better the heroism of those who always stood up to dictatorships. His example is indeed a great lesson…And I mean that positively for the fact that…Despite the massive support that he received, he also received a lot of discouragement. An old ally of his, some guy appropriately called Blackface was one of the first persons to blacken the idea of the protest. Some Nollywood, belle-forever-face-front-chop-money-money-finish-carry-go characters also opposed Tuface. 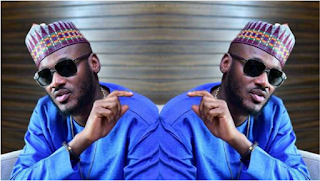 Some musicians too, although in the long run, Tuface was able to mobilize the support of every section of the Nigerian community at home and in diaspora. By Saturday when he poured cold ice on the whole thing, the protest had even grown beyond him, much larger, with others seizing the initiative and turning what he had thought would be a small show into a nationwide and diaspora event. At that point, Tuface was no longer the singer of sultry songs, but the symbol of a rebellion. The enormity of that potential must have frightened him. He didn’t have the courage to see it through. Leadership is about courage. A coward can never lead a rebellion. But we should struggle to understand his situation. He was accused of having seven children from three women, which is an absolutely stupid point. An artist does not have to be a saint. We relate to their art and their engagements with society on the basis of the positive value that they bring forth. It is also possible that Tuface received pressures from his multiple in-laws, and even the Baby Mamas defending their stakes in his life. The official wife must have been accused of trying to encourage him to get into trouble so he could get killed and she alone can sit on his estate. The Baby Mamas and all the in-laws must have called to remind him that his children are still very young and he needs to be alive to be their father and so he should think twice before going to use his chest to stop Nigeria Police bullets. Family members, to whom he is obviously a breadwinner, must have advised him to stay with his singing and dancing and not get involved in politics. They would remind him how Fela’s mom got killed and how Fela’s house was razed down, and how every artist who dared the Nigerian government ended up in exile or in prison or with a strange motor accident. The Nigerian government was, of course, unhappy with the planned protest, and the idea of it created enormous confusion in Abuja and Aso Rock. While the office of the Acting President spoke about the right to protest and the government not having anything against the expression of fundamental human rights, the Office of the President on vacation made it very clear that the would-be protesters are enemies of the government of the day and sore losers. Those two seemingly contradictory impressions from Aso Rock can only point to one thing: high-level intrigue within. That is probably why the Nigeria Police kept shuffling: we don’t approve of the protest, we do, we don’t, we beg. The timing says it all also. With the President out of the country, and the plan of the protesters to welcome him with a Trump-like protest from Abuja, to Lagos, Port Harcourt, Uyo and Akure, and in parts of the Western world, the damage would have been incalculable. And Tuface would have been held responsible for leading the sabotage. No Nigerian government since 1999 has benefitted from any mass protest. The anti-third term protest hobbled the Obasanjo government. The Jonathan government never recovered from the pro-fuel subsidy protests of January 2012. Tuface and his planned protest had set the stage for a similar prospect for the Buhari government. By pulling the trigger at this time, Tuface simply put a lot of people under pressure and placed their jobs and loyalty at risk -no doubt about it, they must have come after him with a sledgehammer to stop and discourage him. Clear evidence: a counter-revolutionary #IstandwithBuhari protest has already been announced to last for two days. The Tuface revolution that has been abandoned by its main motivator teaches us more lessons about the dynamics of power in Nigeria and the temperament of the resident power elite. Will the protest now take place on February 6, without Tuface? Or will everyone hold fire and down their tools of anger? What is certain, however, is that Tuface is likely to sit at home tomorrow with Anne, his temptingly pretty wife by his side, watching the latest episode of Big Brother Naija on TV, with chicken and salad before him, and a bottle of wine, and one of his hands, innocently setting the stage for the amorous prelude for child number eight. With his wife telling him: “Don't worry yourself, dear, Nigeria is not worth dying for. Who wan die make e go die. You have tried your best, my darling husband!”. Let no one blame Tuface. His stage name Tuface is the name of Janus: the two-face Greek god, who looks in two directions. When it mattered most in his career, Tuface Idibia answered the call of his name!